There are two new murals at the middle school. 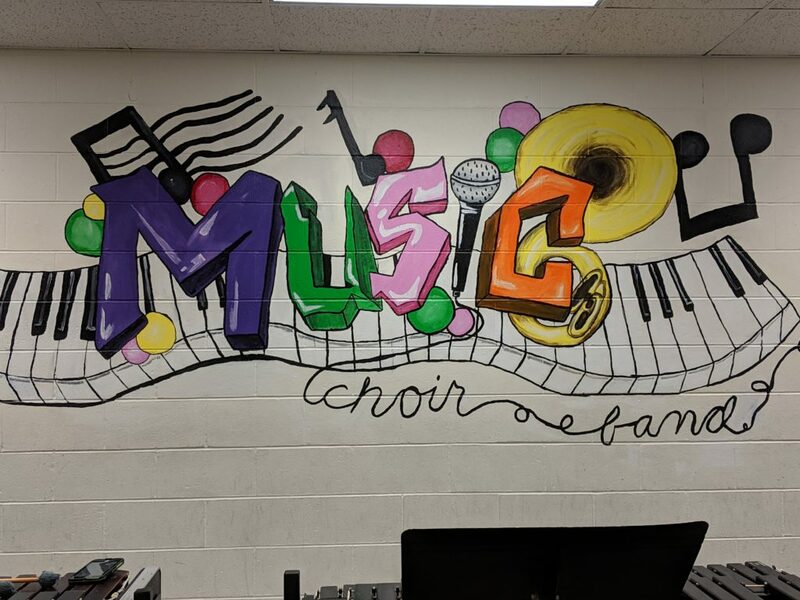 The National Junior Art Honor Society has completed their annual mural this time on the back wall of the band/choir room. Two ideas were combined by Ella Jacobson and Samantha Roach to come up with the current design. Once it was approved, Mrs. Edgren sketched it onto the wall and NJAHS members painted it in the hours after school. This mural was completed in just over a week. Some of the students that worked on it were Ella Jacobson, Shaelynn Roemmich, Alexis Gill, Maggie deFreese, Sheree Russell, Hanna Swearingen, and McKaden Smith. 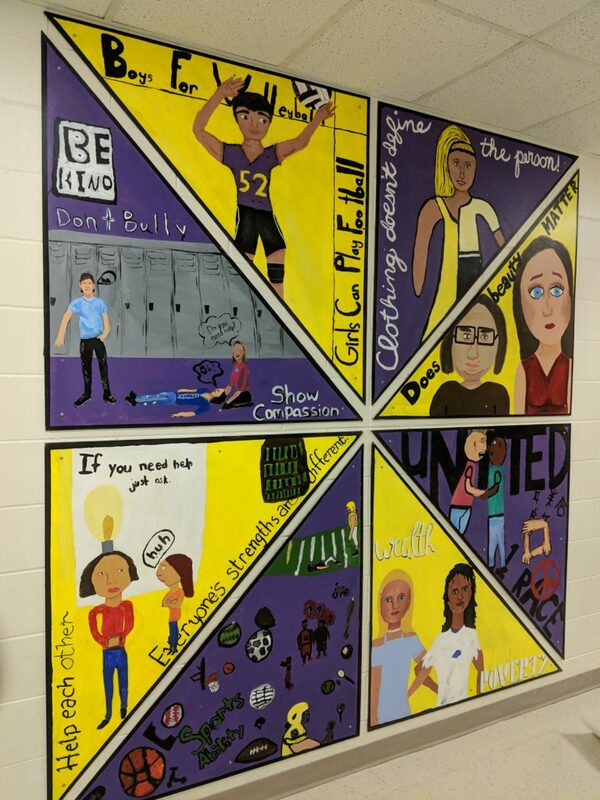 The second mural was actually completed during 1st quarter by the 7th grade class, but was just hung by the janitors this last week. This painting was a culmination of a social justice project. 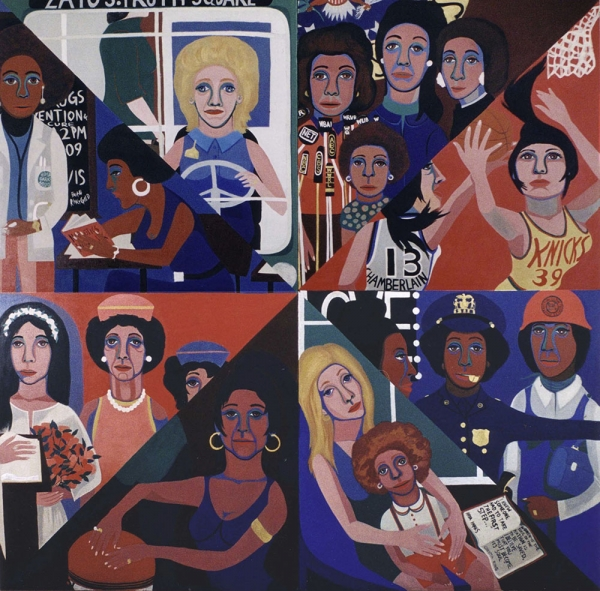 Mrs. Edgren asked students, “How do people contribute to awareness and understanding of their lives and the lives of their communities through art-making?” Students studied the work of Faith Ringgold and how she tried to initiate change through her work. She actually completed a mural outside of a NYC women’s prison meant to give hope to the convicts based on their dreams. She used a pattern of Kuba triangles to represent her African heritage. Seventh grade students created a mural in the same way containing 8 triangles. The class was split into 8 groups that each painted a theme centering around inequalities at Holdrege Middle School. They were challenged to promote kindness through their work tying into the Wonder movie everyone was able to see last year. Each group chose a different aspect of the theme to represent, but still needed to find a way to unify the work as one piece. Please stop and see the finished work in the 7th grade hallway.